Gauge (AWG), formerly known as the Browne and Sharpe Gauge (B&S), is the standard generally employed in this country and where American practices prevail. In defining conductor sizes, the circular mil (cmil) is usually used as the unit of measurement. It is the area of a circle having a diameter of 0.001 in, which works out to be 0.7854 × 10–6 in2. In the metric system, these figures are a diameter of 0.0254 mm and an area of 506.71 × 10–6 mm2. Wire sizes are given in gauge numbers, which, for distribution system purposes, range from a minimum of no. 12 to a maximum of no. 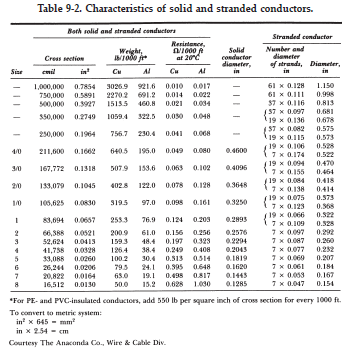 0000 (or 4/0) for solid-type conductors. Solid wire is not usually made in sizes larger than 4/0, and stranded wire for sizes larger than no. 2 is generally used. Above the 4/0 size, conductors are generally given in circular mils (cmil) or in thousands of circular mils (cmil × 103); stranded conductors for distribution purposes usually range from a minimum of no. 6 to a maximum of 1,000,000 cmil (or 1000 cmil × 103) and may consist of two classes of strandings. These wire sizes and their dimensions are given in Table 9-2.
where n is the gauge number (no. 0 = 0; no. 00 = – 1; no. 000 = – 2; no. 0000 = – 3). It will be noted that the diameter of the wire doubles approximately every sixth size (e.g., no. 2 has twice the diameter of no. 8), and the cross-sectional area therefore doubles every third size and is 4 times as great every sixth size (e.g., no. 2 has twice the area of no. 5 and 4 times that of no. 8). The diameter of stranded wire is approximately 15 percent greater than the diameter of a solid wire of the same cross-sectional area. The gauge numbers and wire designations apply to conductors of all materials. Usually, however, the equivalent wire sizes are denoted for the several materials in comparison to copper (e.g., 4/0 aluminum is equivalent to 2/0 copper). These are indicated in the tables for such conductors.